This home has 3 bedrooms and a completely fenced in back yard, and only 3 blocks from Damon Point beach, a favorite for agate hunters and bird watchers! 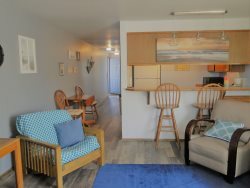 The Anchor Beach Cottage is in Ocean Shores down at the Marina 4 miles south of downtown. The Master bedroom has a queen bed, 2nd bedroom has 1 queen bed and 1 double bed, the 3rd bedroom has 1 queen bed. There is also a double size aero bed. All homes do require the first night plus tax for deposit. This deposit is non-refundable. If you cancel, this deposit IS NOT returned. There is a 2 night minimum stay, 3 nights during the holidays. All homes have a cleaning fee. You must be at least 25 years. old to rent one of our properties. Smoking is strictly prohibited. Dogs are okay with a additional fee $25 per dog per night plus tax and due at check in. Thank you so much for allowing us to use your home! It was so wonderful and our children had such a good time! Amazing home! Everything you need in this house and will be coming back! Staff who checked us in and out were friendly and helpful. The house was warm, clean and had a great layout. It was a lovely time of the year and we enjoyed our time in OS. The backyard was wonderful for our pup and we loved the hot tub and new wonderful deck. My only issue with the house was that the west gate in the backyard did not latch, which was a problem for our dog. Thank you, we hope to stay in your home again in the future. The property was great and we enjoyed our stay. Good to be with family again. We really enjoyed our stay in Rick's house. The kitchen was exceptionally well stocked with anything we needed. The beds were very comfortable. We had lots of room to relax and spent more time at the house than downtown. The fenced backyard made for a good time for our four-footed family members; they were able to come and go at their leisure. The hot tub was welcome relief after a day at the beach. The staff responding very quickly to my emails in a considerate, friendly manner. The house was well stocked with dishes, towels, games, etc. We loved having a washer & dryer!